What to Eat During Cancer Treatment’s new edition puts a fresh spin on a stable of delectably solid recipes, introducing gluten-free menus and new reference sections on food safety and vitamin supplementation. Cancer treatment is a stressful time; appetites change during the course of a patient’s treatment. Thoughtful and organized, this cookbook confronts such challenges with recipes that address the shifting nutritional demands of those undergoing treatment. Recipes address seven side effects with color-coded symbols to denote the category covered. Banana pancakes are there for those grappling with nausea, while an acai-banana-raspberry smoothie bowl is there to address unexpected weight loss. Overlapping symbols indicate when recipes can be used to satisfy the nutritional demands resulting from other effects. An entire section is dedicated to simple snacks and drinks that cancer patients can keep bedside in order to maintain hydration and have a source of calories. Recipes range from easy, one- or two-item fortified drinks to moderately complex dishes involving ten ingredients or less. Ambitious dishes, like chicken and aromatic yellow rice, tandoori turkey breast, and chicken tagine, are also included. Gluten-free recipes include options like nutrient-rich quinoa sweet potato patties. Easy-to-follow steps are manageable for those at all experience levels. Recipe descriptions provide suggestions for nutritional boosts for those with more robust appetites, as well as proposing useful substitutions based on one’s symptoms. Call-outs at the bottom of the page deliver tips for enhancing dishes for non-ill family members. Because recipes satisfy nutritional requirements in overlapping categories, there is some repetition between the different sections. 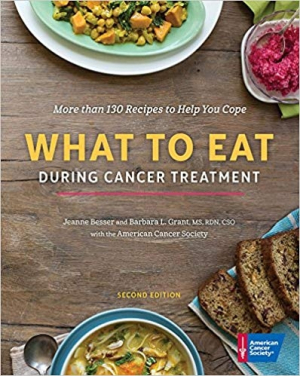 While designated as a cookbook specifically for patients undergoing cancer treatments, the recipes of What to Eat During Cancer Treatment are flexible and can be adopted by those who simply desire a more nutritionally balanced diet. Its more than 130 recipes will ensure that all appetites can find sources of culinary satisfaction.